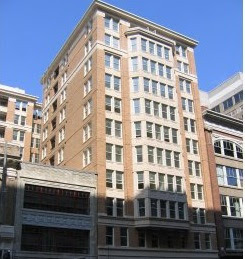 The Artisan, located at 915 E St NW, is one of the latest buildings to begin delivery, with 65 sales recorded by the District in the period November 2006 - January 2007; 95 have either not sold or have not had their sales recorded. Originally sold out December 2004 in pre-construction sales, the Artisan Condos began occupancy in late 2006 and are now reselling units that never settled (i.e. the "final release"). Prices for the 160 condos originally started in the mid-$300k's, remaining units start in the high $300k's. Located 2 blocks from the MCI Center one block to Metro. The Artisan includes fitness center, e-lounge, 24-hour front desk, and underground parking, with advertising emphasis on luxury finishes. Developed by the JBG Group, marketed by McWilliams/Ballard. 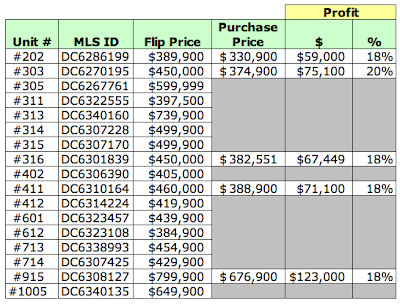 The Artisan may also be the frothiest condo building in DC in terms of speculators bailing out: five of the units closed through January are listed for sale on MLS, joined by another 12 that have not been recorded by the District yet, for a total of 17 listed for sale in the MLS. Craigslist has four advertised for sale, accompanied by eight advertised as rental units. For the mathematically inclined, that means that as of this date, 29 of 160 units - almost 20% - are in play. People who bought condos in the Artisan in late 2004, at the height of the boom, are now quickly doing whatever they can to salvage their financial well-being. Seventeen are listed on the MLS [see below]; the potential profit for those units already recorded by the District is noted, too. $397,500, unit #311, originally purchased for $329,900. "Seller incentive: One year of paid condo fees!! " I like this site. unit 1005 is still in the hands of the developer so it isn't a flip. it's price these days is in the high $500s. it's 1090 square feet. shows you wait a tailing market can do to prices. You're right. I'm more careful now to exclude listings of a building's marketing company. Unit #1005 is currently listed [MLS DC6340135] for $599,900, a $50,000 price reduction that I'm sure thrills its neighbors.